It’s been three years since the nuclear disaster at Fukushima. 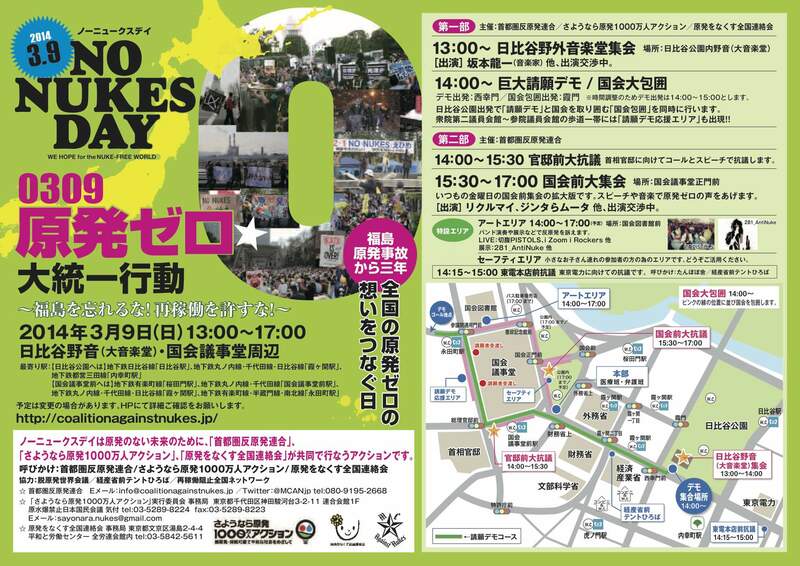 Following on from NO NUKES DAY events on June 2 and October 13, we invite you to join us in a major demonstration against nuclear power in conjunction with Metropolitan Coalition Against Nukes, Sayonara Genpatsu 10 Million People’s Action and Genpatsu wo Nakusu Zenkoku Renrakukai. ▼Help us spread the word! Three years have passed since the Great East Japan Earthquake and ensuing disaster at the Fukushima Daiichi Nuclear Power Plant on March 11, 2011. Some 140,000 people have still not received satisfactory compensation, forcing them to live in extremely tough conditions. There is still no outlook for resolution to radiation-tinted water leaks and other critical problems. Despite this, the Abe administration and the LDP have thrown out the goal of eliminating nuclear power from the basic energy plan and are trying to force through nuclear power restarts and export as well as the nuclear fuel cycle. Thanks to the nationwide anti-nuclear movement in Japan, no nuclear plants are currently in use. This reflects the true wishes of the country’s citizens. Nuclear power generation is an old technology that is not required to supply sufficient energy to the country’s people. It is merely collusion between bureaucrats, politicians and big business. The battle is far from won and it is critical for us as the citizens of Japan to voice our disapproval of nuclear power and stop the government from restarting any nuclear facilities. Our hope is to rid Japan of nuclear power as soon as possible. Join us on March 9 for NO NUKES DAY and take part in the nationwide action around March 11 for NO NUKES WEEK. Let’s not forget about all those people that are suffering as a direct result of the nuclear disaster at Fukushima. – Please make appropriate preparations for all weather conditions. – Approach staff if you feel unwell. – Make sure all banners and signs are related to the anti-nuclear movement. – Solicitation to participate in religious or other group strictly prohibited. – Please do not distribute any printed material to participants that has not first been approved by organizers. If you deposit from another bank, use the branch number 019. *Please put “0309 donation” in the reference section. Please download and help with distribution. Includes program and map. For large amounts, please contact us. * Please understand that we are unable to specify date/time of delivery. * Please also note that we may be unable to provide the number of fliers requested. 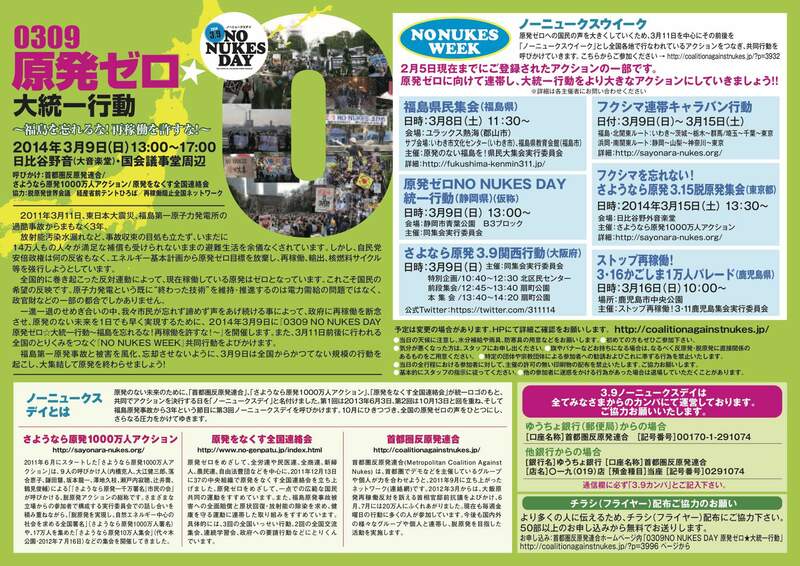 The week surrounding March 11 marks NO NUKES WEEK. Join in one of the nationwide protests against nuclear power. Various anti-nuclear events are planned for the week surrounding March 11 marking three years since the nuclear disaster at Fukushima. Sayonara Genpatsu 10 Million People’s Action, Genpatsu wo Nakusu Zenkoku Renrakukai and Metropolitan Coalition Against Nukes have designated this week as NO NUKES WEEK and are calling for joint action against nuclear power generation. Please take part in one of the events in your area.